Pick Up The Tips About Things That Marathon Training Plans Leave Out!Completing a marathon is a feeling like no other. For most people, it ranks as one of the most thrilling accomplishments on their life's resume. Once you've trained for and finished a marathon, you'll have the feeling there is little in life that is outside your grasp if you are determined to grasp it.The standard length of a marathon training program is 18 weeks. As a first time marathoner, you will have a lot of questions during those 18 weeks. The task at hand is daunting and even the best prepared marathoner will make mistakes. The myriad of decisions that you are faced with in the weeks leading up to the event will pale in comparison to the deluge of things you will need to think about on race day. The stress and rush of emotions that you will be faced with in the days leading up to the marathon do not lend themselves to sound decision making. There will be things you forget about, or don't consider at all. And having something spring up in front of you when you are in a panic approaching the starting line is not the way to start one of the most thrilling journeys of your life.50 Things To Know Before Running Your First MarathonThis is my list of 50 things you should know and consider before running your first marathon. I've run dozens of marathons over the years and have accumulated a checklist of sorts. Most of these things are on this list because at one time or another I've made a racing faux pas or spent needless time worrying about something that I vowed to not repeat. I hope you can benefit from my original cluelessness and more adequately enjoy your journey into the fabulous adventure that is the marathon. This document is geared towards providing exact and reliable information in regard to the topic and issue covered. The publication is sold with the idea that the publisher is not required to render accounting, officially permitted, or otherwise, qualified services. If advice is necessary, legal or professional, a practiced individual in the profession should be ordered. The information herein is offered for informational purposes solely, and is universal as so. The presentation of the information is without contract or any type of guarantee assurance. Before beginning any new exercise or new diet program it is recommended that you seek medical advice from your personal physician. 7 – Fall or Spring Marathon? 15 – Beware of Chafing! 46 – How’s That Urine? 48 – Know Your D.O.M.S. Completing a marathon will leave you with a feeling like no other. For most people, it ranks as one of the most thrilling accomplishments on their life's resume. Once you've trained for and finished a marathon, you'll have the feeling there is little in life that is outside your grasp if you are determined to grasp it. There are two events in my life that stand out as moments of startling self-discovery. The first happened at age 32 during the birth of my first child. I thought I knew myself and understood my narrow range of emotions, until I stood weeping at the sight of my newborn son. The second happened about 10 years later when I ran my first marathon. I considered myself a mental rock, unflappable in the face of imminent crises, and then mile 18 happened. The standard length of a marathon training program is 18 weeks. As a first time marathoner, you will have a lot of questions during those 18 weeks. The task at hand is daunting and even the best prepared marathoner will make mistakes. The myriad of decisions that you are faced with in the weeks leading up to the event will pale in comparison to the deluge of things you will need to think about on race day. The stress and rush of emotions that you will be faced with in the days leading up to the marathon do not lend themselves to sound decision making. There will be things you forget about, or don't consider at all. And having something spring up in front of you when you are in a panic approaching the starting line is not the way to start one of the most thrilling journeys of your life. 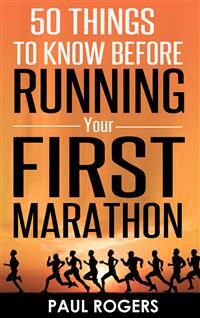 This is my list of 50 things you should know and consider before running your first marathon. I've run dozens of marathons over the years and have accumulated a checklist of sorts. Most of these things are on this list because at one time or another I've made a racing faux pas or spent needless time worrying about something that I vowed would not happen again. I hope you can benefit from my original cluelessness and more adequately enjoy your journey into the fabulous adventure that is the marathon. Running a marathon is not for everyone. There are a host of things to take into account before deciding if you really, REALLY want to do it. It is certainly a decision that needs to be factored based on the “burden vs. benefit” rule. Of course I believe the benefit far outweighs the burden, but I like running these things almost to a pathological degree, so I’m sure a more level headed person would approach the decision differently. So let’s have a look at the initial things to consider, starting with the obvious but still-needs-to-be-stated truth about the race.